I love that moment when you pick up a candle that you have no intention of buying because you're just waiting for someone and you smell it only to find that not only does it smell heavenly, but that it's also only £5. That's how I came to find this gorgeous jar candle from Next. 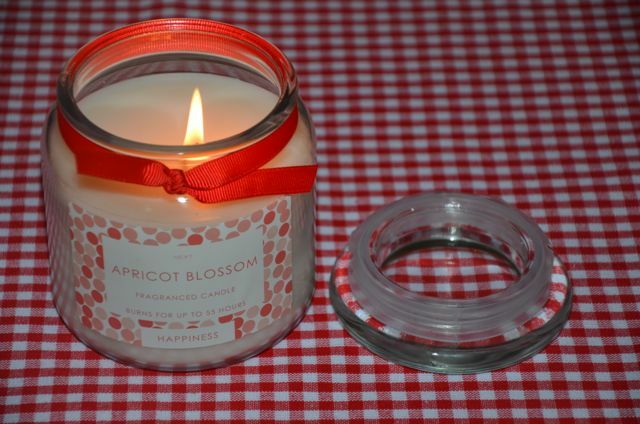 I was waiting for my husband and wasted no time doing a little browse through the shops when I fell victim to the sweet scent of Apricot Blossom. I can't say enough about this candle… The label is so cute, the ribbon adds the perfect little touch and as I said before, it smells like heaven. What more could you want for just a fiver? Unfortunately I'm not able to find this candle online, but I found it in-store at Next just about a week ago. You can however grab the same scent online in the diffusers, which come in two different sizes.